What is HOT in China at the beginning of the Year of the Tiger? Browsing through Tianya forum, one of the most popular Chinese forums ( along with MAOPU, Xisi）has become a daily habit of mine to follow the interests and concerns of China’s netizens. I am always fascinated by the diversity of topics people take interest in, which range from exposures and rage over local governmental corruptions to experience-sharing about how to prevent your husband/boyfriend from having an affair. Two popular posts after the Chinese New Year celebration especially seem interesting to me, and I thought through them you might be able to have better a sense about what are the things grassroot population in China are interested in. But if you read Chinese, I seriously recommend you visiting the forum yourself. You might get a little overwhelmed at first, since most Chinese websites do not care much about user-friendly interface and regular visitors of the forum use all kinds of jargons and abbreviations ( some purely for fun, some to better evade censorship). Yet once you get use to it, you would surely be greatly entertained. And Chinasmack do provide full translations for some of the most hyped stories on those forums. 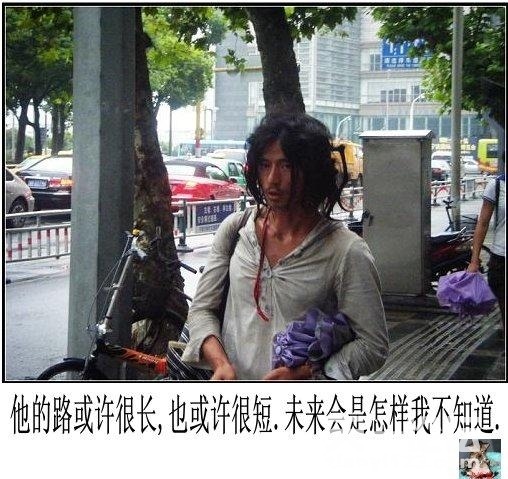 “Brother Sharp” is a begger that an amateur phogographer happened to take some street shots of in Ningbo. His pictures debuted in a photography forum, yet soon they gained immense popularity due to the his well mashed-up bohemian outfits and his melancholy yet unrestrained air. Netizens hailed himself as more stylish and avant-garde than Hollywood Celebrities and Korean/Japanese drama actors. The sad-side story was also revealed through netizen’s “human flesh search engine“. 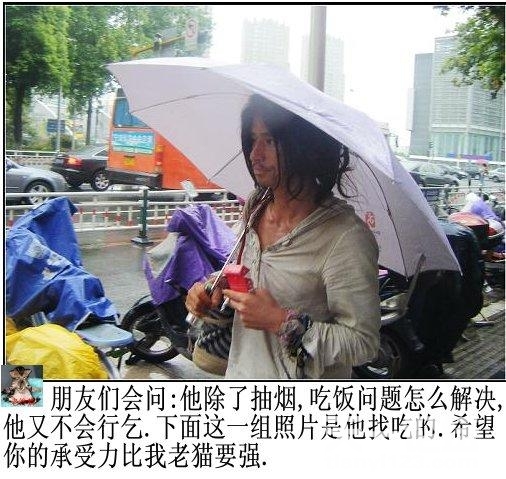 One netizen from Hangzhou claimed that he interviewed “Brother Sharp” last year as part of his research project about homeless people who might be suffering from mental illness in Ningbo. 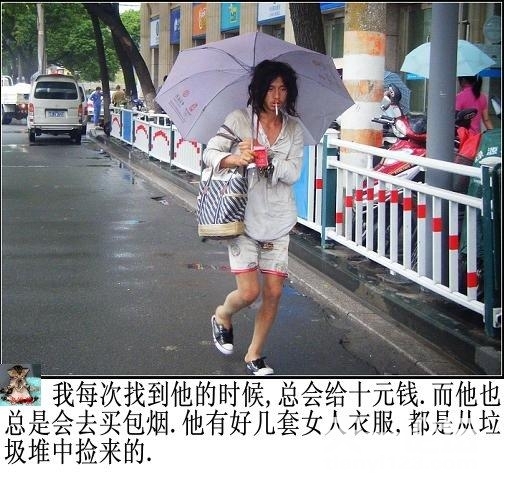 “Brother Sharp” is clearly a victim of past emotional trauma, the netizen claims, because at times when “Sharp Brother” is sober, he makes comments that he wants to find a woman to love him, and is trying to make himself feel completed by wearing women’s cloths. 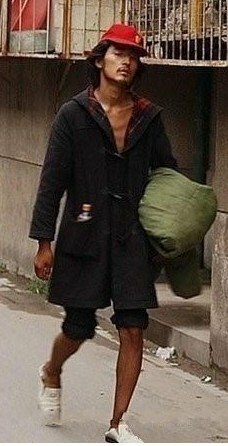 Thus suddenly, amid all the admirations of “Sharp Brother”s handsomeness and style, people are also calling for proper social care for those more out there roaming on the street suffering from mental illness. Potential for more activism? Let us wait and see. For now, let us see how “Brother Sharp” drove everybody crazy. Today I want to begin with a pretty good summary of how internet change the way social incidents are treated in China. It was from a speech intended to give at the 2008 Chinese blogger conference by Roland Soong, one of the most influential bloggers in the Greater China Area who translates daily news and updates from the Chinese blogsphere into English. You can find his blog “EastSouthWestNorth” here. There are two observations we can get from the pictures he gives: First, after the arrival of the internet, social grievances have many more channels to be heard and its more likely for them to be addressed. Second, it seems like afte the internet boom in China, western media plays a much less influential role in shaping governments’ response to social incidents. One reason is perhaps that they cannot be as updated as the p2p communication on net, and another is perhaps, after China’s rise, CCP honestly does not care that much about what foreign media says anymore. It’s the opinion of the people that they take serious notice of. And it’s arguably true that, foreign media in general lost their credibility to shape the opionion of Chinese people due to their hostilities – some perceived, some manisfested – towards China’s rise since the 2008 Olympic Games. 1. A bad thing happens somewhere in China (such as police brutality, government malfeasance, a forced eviction, a coal mine disaster, etc). 2. The local government suppresses all information. 4. The victims begin a petitioning process up the hierarchy in order to seek justice. The road is long and hard (see The Long Road To Petition) with dim prospects. Yet things start to change around 2003 when Soong himself started blogging. 4. The victims begin a petitioning process up the hierarchy in order to seek justice. The road is long and hard, and nothing ever comes out of it. 6. Western media catch wind of the incident, and follow through. This creates an international scandal. 7. Senior Chinese officials take notice, and corrective actions are taken. 3. All media reports are censored. 4. The victims begin a petitioning process up the hierarchy in order to seek justice. The road is long and hard and nothing ever results. 5. The Internet forums/blogs rushed to report on the case. 6a. Within 48 hours, all traces of negative (i.e. against the authorities) information are erased by order of the authorities, or else by self-censorship at the portals/forums/blog service providers. 6b. Positive (i.e. on behalf of the authorities) information appear from Internet commentators who are paid by the authorities for their efforts. 6. Western media catch wind of the incident, and follow through with an international incident. 7. But there are just too many portals/forums/blogs that important information will eventually seep through. 8. Senior Chinese officials take notice, and corrective actions are taken.